This is Squiggy, who lives in Canada. 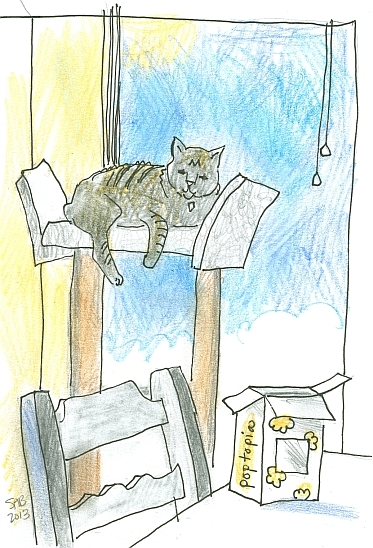 He loves his high perch. The popcorn box was just sitting on the table and I liked the design of it. The old library in Jackson, New Hampshire sort of reminds me of a gingerbread house. Jackson now has a new library, so to speak. 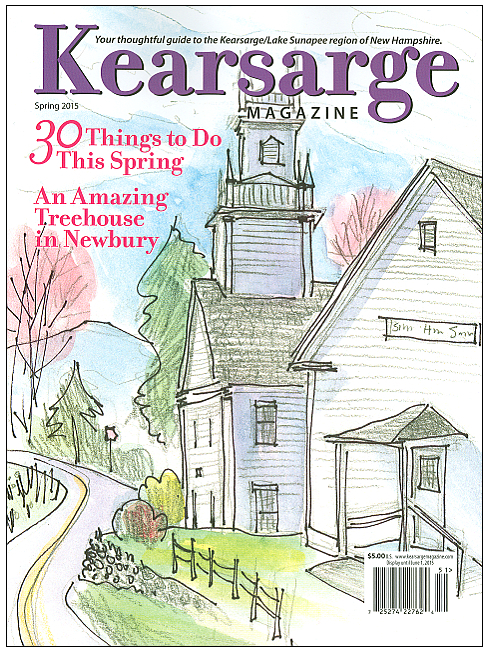 An old barn was moved and marvelously renovated into a new town library about a half mile away. This building is still in use for community activities. Gingerbread houses are very popular this time of year, at least in the U.S. I call this drawing “Seasonal and Unseasonal”. 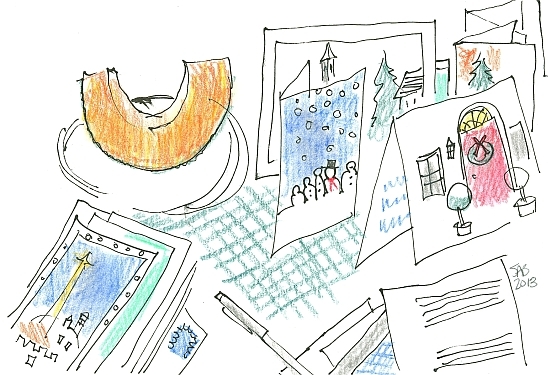 The many cards on our table tell us that it is the Christmas season, with wishes for the New Year 2014. The cantaloupe melon is not in season here in New Hampshire, but was grown somewhere warm and shipped here. It was ripe, delicious, and tasted of summer. 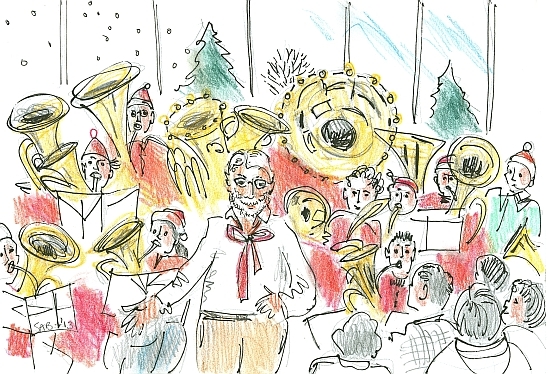 Tuba Christmas happens every year in New London, and in lots of other places around the world as well. This is the third year that I have drawn it. The conductor never knows who is going to show up or what sort of tuba-ish instrument they might be bringing with them. One rehearsal in the morning, and it’s on with the show. Fun and humor abound! I had an index card with me when we were driving from New Hampshire to Connecticut. I was using it as a book mark. These are some mountains, or maybe hills, in Massachusetts just north of Springfield. 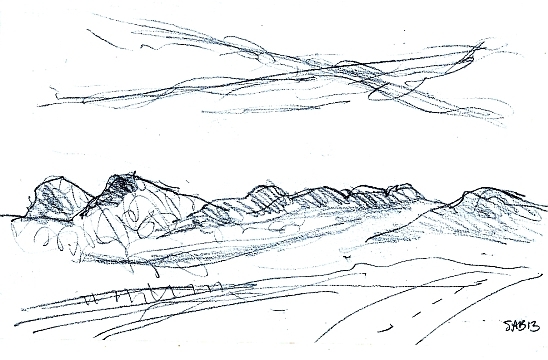 I drew quickly as we passed by these bumpy shapes. I have always loved the way the light hits them, and it was a pleasure to try to capture them with my pencil. It was Christmas day and the sky was filled with contrails, showing that many people were traveling. 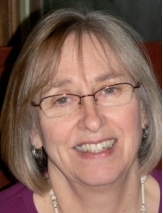 Our older daughter and her husband just moved to Los Angeles, California, from Baltimore, Maryland. From East Coast USA to West Coast USA. On our very first visit to their apartment in the upcoming area of Downtown LA (DTLA), I sketched two buildings. 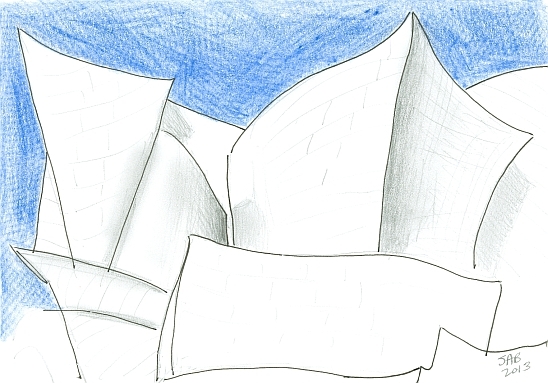 In the drawing above you see the undulating, steel-paneled sides of the Walt Disney Concert Hall. Donated by Disney’s (now late) wife, it is the home of the Los Angeles Philharmonic and the Los Angeles Master Chorale. Designed by the Toronto born architect Frank Gehry, 2013 is its tenth anniversary. 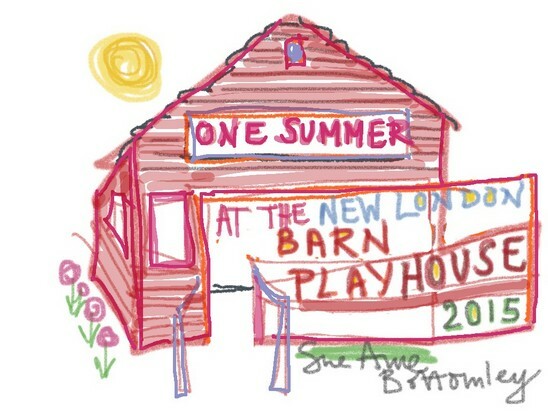 We took a tour and plan to return for a performance during our next visit. Gehry is the same architect who designed the Guggenheim Museum in Bilbao Spain, the Stata Center at MIT, and (earlier in his career) the Merriweather Post Pavilion, Rouse Company Headquarters, and Fire Station in Columbia, Maryland, where we used to live. All were innovative by the standards of the time. James Rouse, the developer of Columbia, the Baltimore Inner Harbor, Boston’s Quincy Market, and numerous other projects was an early supporter of Gerhy. 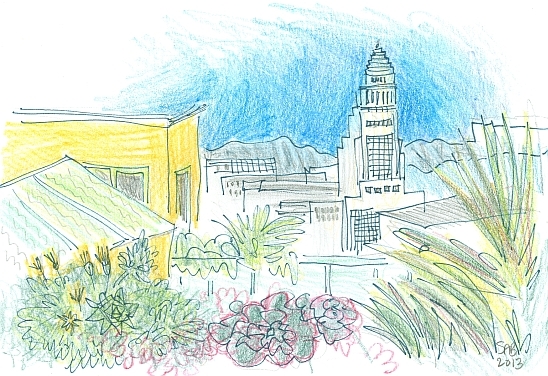 Here I drew the view of the Los Angeles City Hall, 1928, from the tenth floor roof deck of the Judson Building on Broadway in Downtown LA. At 32 floors, it is the tallest base-isolated building in the world. It has been retrofitted to withstand 8.2 earthquake. Did I mention that LA is in a big quake zone? I loved the desert plants on the roof. 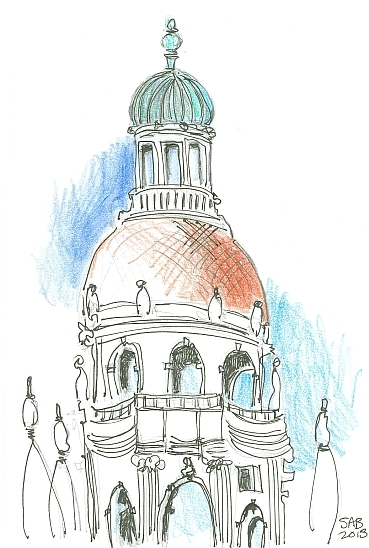 The dome of city hall in nearby Pasadena, California appealed to me. Built in 1927, Mediterranean revival and Spanish colonial revival styles mix. It rises 6 stories. During 2004-2007 the building was renovated, including lifting it off its foundation to make a more earthquake secure base. That is important in this area, and an essential consideration in new construction. This is only the top 2/3 of the tower. 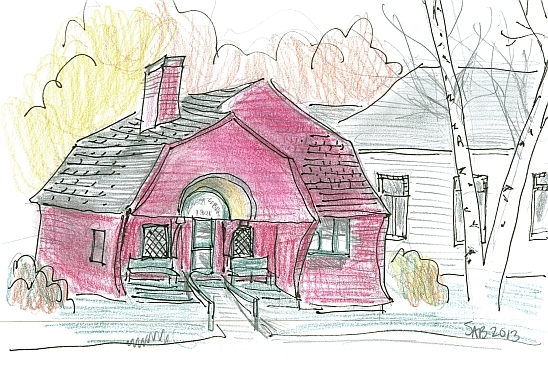 I was mostly interested in the shapes of the open windows and archways. And now, back to the east coast, and the state of New Hampshire. This month is a mix of my interest in bell towers and a recognition of the onset of winter. 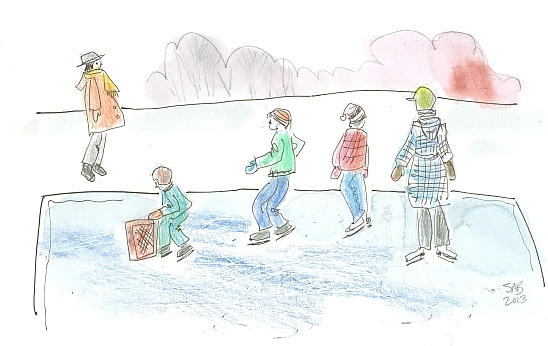 Most years I draw some skaters on our small, outdoor, town ice rink. And It is really larger than this. Artistic license! The little guy is learning to skate by pushing a plastic milk crate around until he gets his balance. This is the bell tower of the Busiel Mill in Laconia, NH.,1853. A sign says that workers here made hosiery, then clocks, then electronic relays, and organs. The building is still in use I believe, but not for manufacturing. We saw the Lamb Knitting machine in action in the Belknap Mill in Laconia. The Belknap Mill is just across a walkway from the Busiel Mill above. 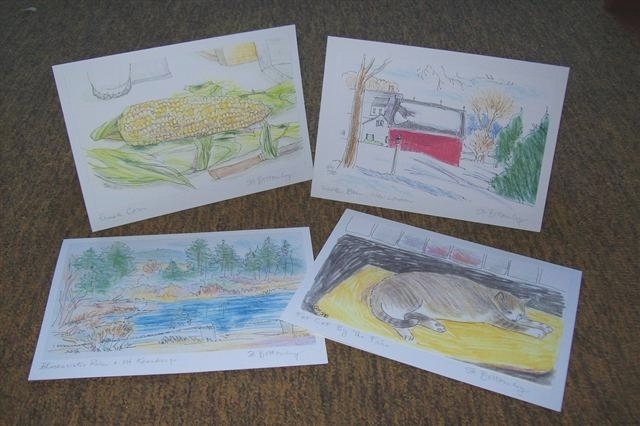 Laconia’s mills were major producers of knitted goods Every mill city had its specialty. 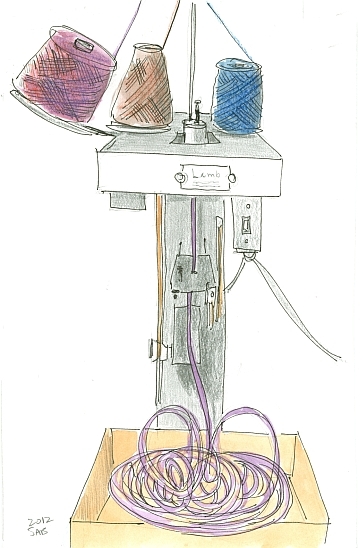 Purple-ish, tweedy shoe laces were inching their way out of this machine and circling into the box on the floor. The mill is a museum now, well staffed with knowledgeable and entertaining guides. The large Canterbury Shaker Village is located in Canterbury, NH. Shakers were a Protestant religious sect that flourished in the 18th and 19th centuries, in both England and the US. Although the sect has faded away, the Shakers are well remembered for many fine qualities: their music, building skills, business sense (they sold seeds for example), furniture making, inventions, and quilts and tinware. 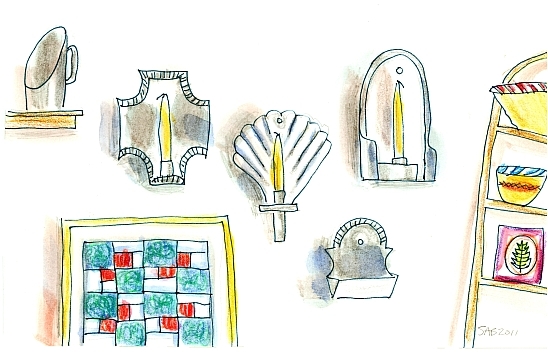 Above, I drew replicas of the tinware, quilts, and other crafts that are for sale in the village. Next to the three candle holders are a scoop for flour or sugar and a match holder. Shaker designs are known for their simplicity, elegance, and functionality. The town green (or common) in Chatham, NH is very green. 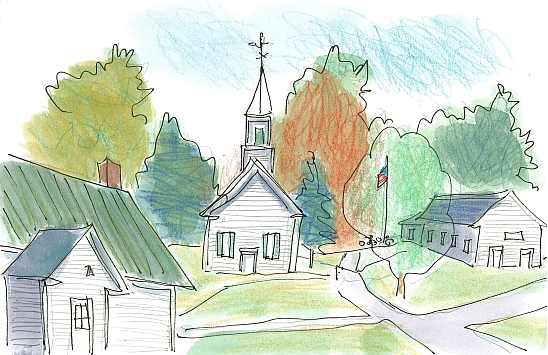 The building on the left is the library and museum, the center is the Congregational Church, and on the right is the Town House, site of the town offices. The easiest way to get to Chatham from New Hampshire is to drive into Maine and back into New Hampshire. 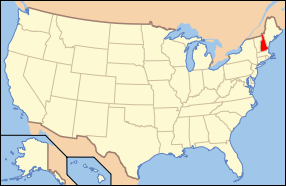 The population is under 350, in an area of 56 square miles, or 147 km². The little town was named in 1767 for William Pitt, Earl of Chatham and Prime Minister of Great Britain. Effingham NH, population about 1500, was named in 1749 for the English family of the Howards, the Earls of Effingham. 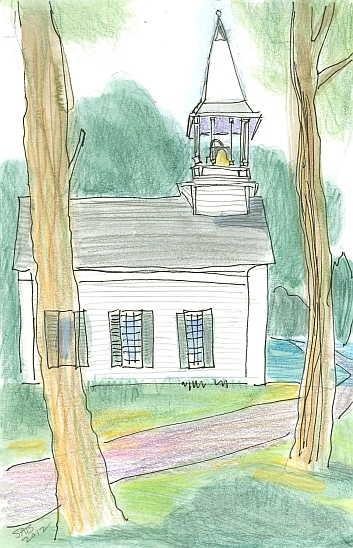 I drew the town Meeting House, dated 1798. The signage notes a Paul Revere bell in the steeple. This is bragging stuff here in New England. But I read that his foundry did produce excellent quality bells, all numbered and locations noted. Rumney, NH is a town of about 1500 people, located at the southern edge of the White Mountain National Forest. The West Rumney Community Church is one of the few cedar shingled buildings in New Hampshire (from my observation) which retains its original brown stained color. I admire its architectural purity. Most shingled buildings built in America between 1880 and 1890 have now been painted white. But recently this style is again popular, with brown cedar shingles and green trim. Rumney is home to the “Polar Caves”, an intriguing rock formation. The town of Hebron, NH curves around the north end of Newfound Lake. Approximately 600 people live here, within sight of the island-studded blue waters. On most days, a good stiff wind produces white caps on the waves. The Newfound Audubon Center is one of five Audubon wildlife parks in the state, especially interested in documenting the long (South America) migration patterns of native birds. 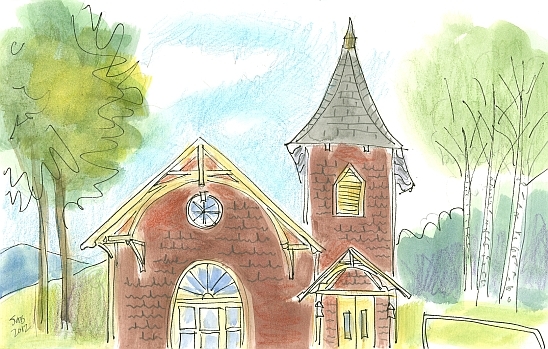 I wanted to include another New England bell tower which is neither a church nor a factory. This building is currently the home of the Hebron Town Offices. 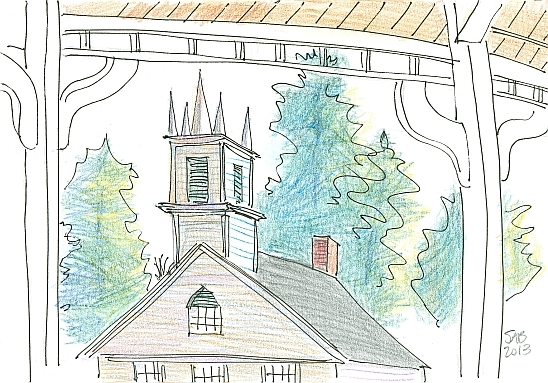 When first built, I believe the wooden clapboarded steeple was the bell tower of the Hebron Academy. 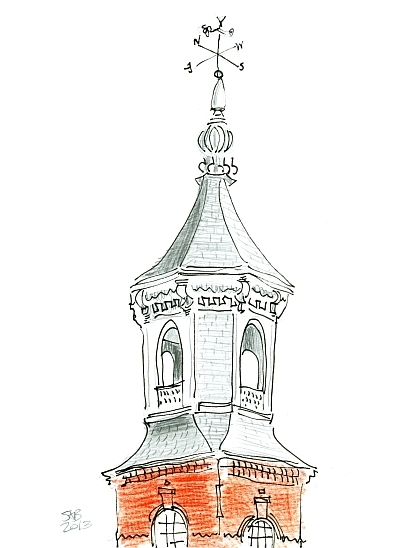 A bell tower was a village’s system of calling out to its inhabitants, either for church services, school classes, factory shifts, or any emergency like a fire. The surrounding structure which makes a picture frame for the composition is the town bandstand on the town green or common. 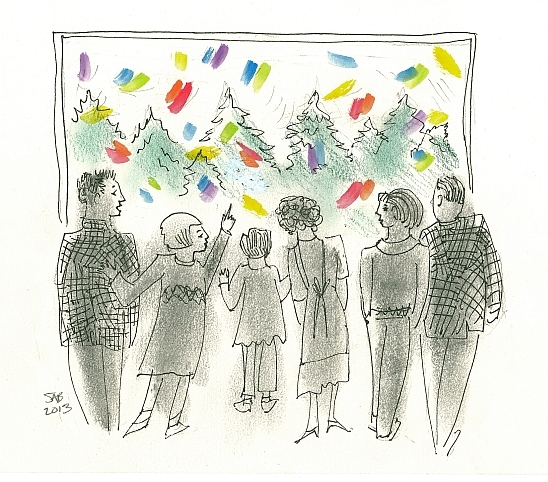 And lastly, a memory drawing of a favorite holiday family moment. I am the pointing girl at about age 10. My sister is the smaller girl about age 5. The others are an aunt, two uncles and a cousin. We are all gazing at nature’s splendid light show. Ice crystals on the trees, plus the angle of sunshine, plus the steady gentle breeze produced colored light flashes. The crystals were prisms, and we all watched and called out the clear bright colors we saw. It was the best present.